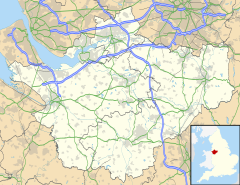 Davenham (pronounced Dave-n-ham) is a rural village and civil parish approximately 3 kilometres (1.9 mi) south of the town of Northwich, part of the Borough of Cheshire West and Chester and the ceremonial county of Cheshire in England. It has a population of 5,655, reducing following reorganisation to 2,745 at the 2011 Census. The village is close to the A556 and A533 roads and both the River Dane and River Weaver. It is the birthplace of marathon world record holder, Paula Radcliffe. Davenham is recorded in the Domesday Book as Devenham. Its name means "hamlet on the River Dane". The site of the Norman Shipbrook Castle by the River Dane is indicated by the name of Castle Hill, between Shipbrook Bridge and Shipbrook Hill Farm, but no traces now remain. In 1936 the whole of Eaton (near Davenham) and part of Leftwich civil parish (which extended into Davenham village) was added to Davenham, and in 1955 part of Davenham was transferred to Northwich civil parish. Between 1996 and 2006, a large housing development was built on farmland to the northwest of the village centre. The estate is known as Kingsmead and is separated from the historic village of Davenham by the A556 Northwich bypass. This area was originally the Kingsmead ward of the civil parish with five members representing the ward on Davenham parish council. Following a community governance review, Kingsmead became a separate parish with its own parish council in April 2011. In 2006 the Kingsmead Residents Association was formed by residents who were concerned at the state of maintenance of the public areas of the estate. By Easter 2007 the association had over 500 members and expanded its interests to cover topics such as litter on the estate, speeding on the main spine and loop roads and the adoption of the estate's roads by the County Council, in addition to the association's primary aim which was to take over the Estate Management company responsible for the upkeep of the public areas of the estate. Davenham parish council along with Moulton parish council decided in 2007 to part-fund a Police Community Support Officer (PCSO) in order to keep a police presence in Davenham and Kingsmead. Due to policing boundaries it was decided that one PCSO from Winsford Neighbourhood Policing Unit would police Davenham and Moulton, whilst a PCSO from Northwich would cover Kingsmead and Leftwich. The village's football team reached the final of the 1887 Welsh FA Cup, losing to Chirk. Davenham is situated in the centre of the Cheshire Plain between the River Weaver and River Dane. 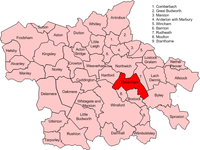 It is surrounded by the civil parishes of Northwich, Hartford, Rudheath, Byley, Bostock, Moulton and Winsford. An electoral ward in the name of Davenham and Moulton exists. This ward covers much of Davenham and stretches to the Northwich area also Winsford. The total population at the 2011 Census was 13,565. The church of St. Wilfrid goes back to the Domesday period but the current edifice is the fourth on the site, dating from a major reconstruction between 1844 and 1870 in the Victorian Gothic revival style. The tower has a recessed spire built in 1850. 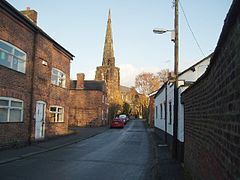 Legend says that the church was founded by St Wilfrid on a journey through Cheshire in the 7th Century, but the first documented evidence of a church on the site is an existing priest and church in 1086. Davenham has traditionally had a Primary school, Davenham Church of England Primary School. However the parish now includes parts of the Kingsmead development which includes Kingsmead Primary School built in 2004. Both these schools are feeder schools to the County High School Leftwich as well as other, more distant secondary schools such as Weaverham or the Grange. ^ "Parish population 2011". Retrieved 27 May 2015. ^ "The Chester West and Chester Borough Council (Reorganisation of Community Governance) Order 2011" (PDF). The Local Government Boundary Commission for England. 30 March 2011. Retrieved 6 May 2017. ^ "Kingsmead to get a parish council of its own". Northwich Guardian. 14 December 2010. Retrieved 6 May 2017. ^ "Ward population 2011". Retrieved 27 May 2011. Wikimedia Commons has media related to Davenham.